We Print Everything, Except Money. Great for trade shows, Our four color printing presses can print all of your marketing requirements with precision and speed at a highly competitve price. We are a promotional product distributor and proud member of the Advertising Specialty Institute. Promotional products, also known as ad specialties, are used by virtually every business in America. Good quality art and design help to sell your products and services; it is with this simple idea that we begin every job for our clients. Full, Partial or Spot Decal Vehicle graphics Make your car or truck work for you. Advertise your business and services everywhere you go. 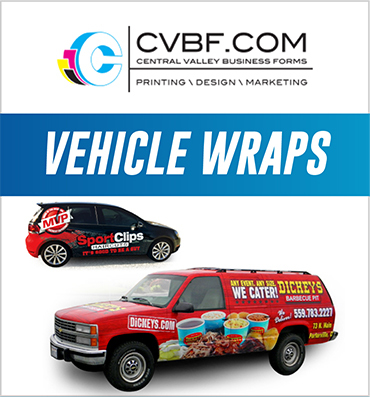 We use only high quality 3M vinyl to create full or partial wraps. Don't want to cover your entire vehicle? Contour cut spot decals on the doors and tailgate will still help get you message across. 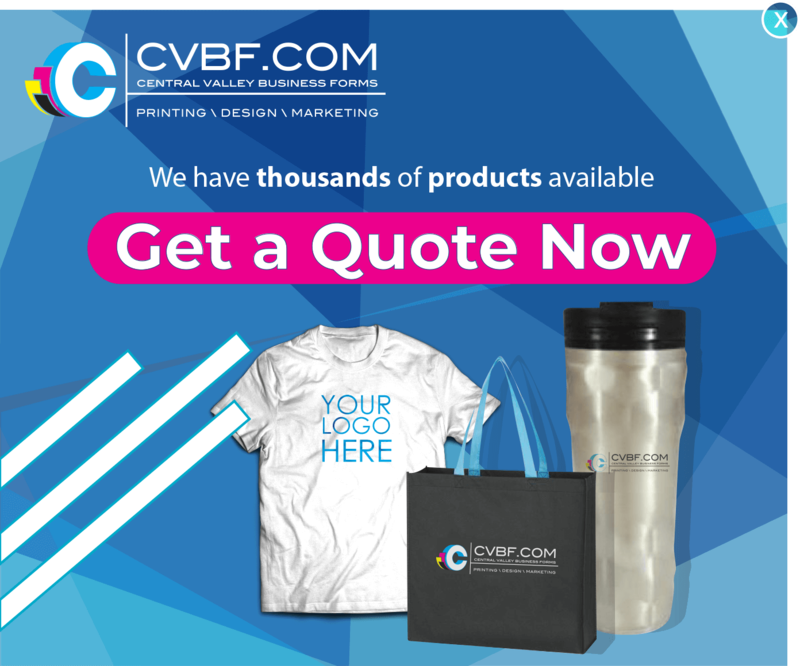 Since 1981, Central Valley Business Forms has provided our clients with the finest in high-quality offset printing, graphic design, and promotional products. As busy professionals, we promise to save you time and money by partnering with a single print source for all of your business products and system needs. By working with our experienced, personable specialists, your requirements are fulfilled from concept to completion. Call us now for a customized proposal! Existing Clients that "Refer a Friend"
Contact your sales representative so they can provide you with a free gift. Call today to find out about our new promos and specials. Sign-up using the form or call us at (800) 350-3595 to take advantage of this exclusive offer.